It’s the worst Christmas disaster since the year the power went out during It’s a Wonderful Life and I witnessed every minute of it. You can see a lot from the top of the tree, and I may have a broken wing, but there’s nothing wrong with my ears, let me tell you. It had been brewing for over a week. It’s all this advent stuff, the counting down until Christmas Day, you know? Used to be you just wrote a letter to Santa and lit a candle every Sunday, but these last few years there’s something new every time you turn around, and if you think these guys like being replaced with something fancier and more trendy, you’ve obviously never met an Elf on the Shelf. That little Elf was really the instigator. The candles on the mantel have been around a long time, almost as long as I have, and they’ve seen enough Christmas traditions come and go that they don’t get worked up about much. Those calendars on the wall get pretty huffy about how no one opens their little doors after the first week, but they’re all talk. I mean, that Elf of the Shelf was a cocky little twit those first few years, so you can’t really blame the calendars for muttering under their breath a lot, but honestly, even if they weren’t pinned in place, they wouldn’t have the guts to do anything rash. Shelfy, though? He was always a little unstable, so it wasn’t exactly a shock that he finally tipped. It was the Lego calendar that did it. You’ve seen these things, right? A fantastic new toy to build each and every day? That Elf may have bells on his toes, but there’s no way he can compete with a build-your-own-spaceship. He tried. I mean, he pulled out all the stops. Wrote jokes on the bathroom mirror with lipstick. Spilled flour all over the kitchen floor. Hung upside down over the kids’ faces when they woke up in the morning. He got their attention with that one, but as soon as the screams died away, he was tossed aside in the mad scramble to see what new little package of magic bricks was waiting for them that day. Everyone went off to work and school, so I was the only one there to see the look on Elf’s face when he crawled out from under the pile of dirty pajamas. Well, me and the wall calendars, and their remarks on the occasion didn’t do anything to improve his state of mind, let me tell you. I think that was the day he started plotting it. Or maybe it was the next day when the little space man mini-figure showed up. That space man was silver and shiny, and he refused to speak at all. 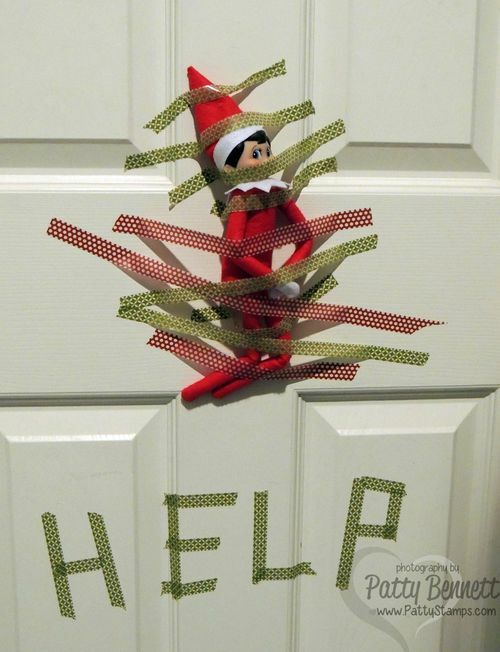 After the kids had gone crazy over him and then been rushed out the door, the Elf tried to start up a conversation. He was pretty obviously fishing for weaknesses, but he didn’t find any because the mini-guy didn’t say a word. The more questions the space man ignored, the angrier the Elf got. It was pretty funny, really, but if I had realized what it all would lead to, I wouldn’t have laughed so hard, believe me. In any case, the next day (this would have been yesterday) Shelfy went around muttering under his breath and pulling bits of tinsel down off the garland on the stairs. I saw him doing it, but I guess I assumed he was up to his usual tricks, going to litter it all over the kids’ pillows or tie it around their toothbrushes or some such nonsense. You know what they say about assuming. He put his plan into action just after dinner tonight. The family was gathered around in the living room watching television, and Shelfy goes and gets out this long rope he’s made by tying those bits of tinsel together. It wasn’t until he started swinging it that I realized he had turned it into a lasso. Let me tell you, that Elf has quite an arm (considering it’s made out of a pipe cleaner). He snagged the Lego calendar in one throw and with a mighty yank, he pulled it right down off the kitchen counter. It crashed to floor in a mangled heap of bent cardboard, and Shelfy let out a crow of victory. He hadn’t counted on the toys that had already been opened, though. This is December 8th, people, which means three little robots, four flying ships, and a ticked off space man. They swarmed. That’s the only word for it. One minute, Mr. Elf on the Shelf is standing there laughing his head off, and the next minute, he’s being dive-bombed by airplanes made of brightly colored bricks. Shelfy’s laugh turned to a scream pretty fast. He still had his lasso, though, and he was determined to use it. He whipped it around so fast he managed to actually take out one of the tiny ships, breaking it to pieces on the tile. The enraged robots now entered the fray, leaping off the counter toward Shelfy’s head. Two of them hit their spot, but the third overshot and hit the wall instead, tearing a long strip right down the middle of the oldest advent calendar. Did I say those wall calendars were all talk and no action? That was before their grandfather was killed. Suddenly, every door on every calendar was opening and closing at one. Tacks ripped out of the walls and those calendars took flight. Yes. I’m serious. I’ve never seen anything like it. The flapped down toward the chair that Shelfy was desperately climbing in a bid to get away from the angry Lego-bots, brushing him and his pursuers to the ground. Both robots broke into pieces, and the Elf scrambled away quick as a wink. He managed to grab hold of the nearest calendar as it lifted back into the air for another attack. He clung tight until it swung him up over the table then let go. The calendars were coming back for another attack, but before they got there, a silver blur streaked across the table. It was the space man. Space Man and Shelfy tumbled off the table and across the floor, over and over, punching and kicking, right down the steps and into the family room. So far, the family hadn’t noticed a thing, but the dog did now. He leaped up from his spot on the couch, barking at the tangled up toys, still going at it on the rug. I guess that puppy thought it was a new game or maybe a threat to the family that he needed to fend off. All I know is, he launched himself into the fray, slamming his smelly, furry self right into the Christmas tree. You guess it. It tipped. I felt it. I had that horrible moment, the one where you know it’s going to happen but there’s nothing you can do to stop it? And over we all went. I managed to flutter a bit with my unbroken wing and save myself, but most of the ornaments weren’t so lucky. At least half of them smashed. The other half lay in shock and terror, wondering why the tree had stopped at forty degree angle. Answer? The tree’s fall had been stopped when the top branches hit the mantle and got lodged there. Good news for the ornaments that never hit the ground. Bad news for the candles that stood on the mantle. Down they went, all in a row like dominoes falling one after the other. Those candles which had hurt anyone or even spoken an unkind word in all their lives were cracked and chipped leaning sadly to one side. The last one fell off completely, rolling slowly across the floor to stop at the feet of one naughty Elf and his mini-figure enemy. Both toys stared in shock and horror. The family stared in shock and horror. It had all happened so fast. One minute all was happy and bright and the next? Disaster. “What just happened?” asked the dad after a second. “I’m not sure we’ll ever know,” said the mom. “That is the craziest thing I have ever seen!” yelled the son. “I couldn’t even see what was going on!” said the oldest sister. “I bet the angel saw it!” exclaimed the youngest sister. But she was right. I saw the whole thing, every single minute, and let me tell you what, it’s time for a little less advent at Christmas time, people. It would be a lot safer for everyone.